View of Aberdeen in Scotland by R. Seaton. 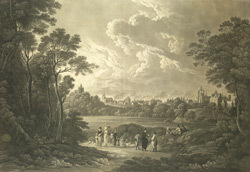 King’s college can be seen to the right of this print with a distinctive stone work arch topping the chapel’s steeple, in the shape of an imperial crown. King’s college was founded in the 15th century by Bishop Elphinstone and became famous for its medical college. The double towers of St Machar’s Cathedral can be seen to the left of the print. Ecclestical buildings have stood on this site since the 6th century but records first describing a cathedral here date from the 12th century. It is thought that Bishop Alexander Kininmund built the west towers and the nave in the 14th century. St Machar’s was extensively rebuilt by Bishop John Elphinstone in the 15th century.